Bifacial solar panel performance has become such a hot topic there are now at least four competing field test sites ramping up in the United States, each matching a different set of trackers and panels. DNV GL, Soltec, NREL and Sandia are all involved, and initial results are expected this year, once a year’s data has been collected. Soltec operates one of four bifacial panel testing sites that will be harvesting data this year. 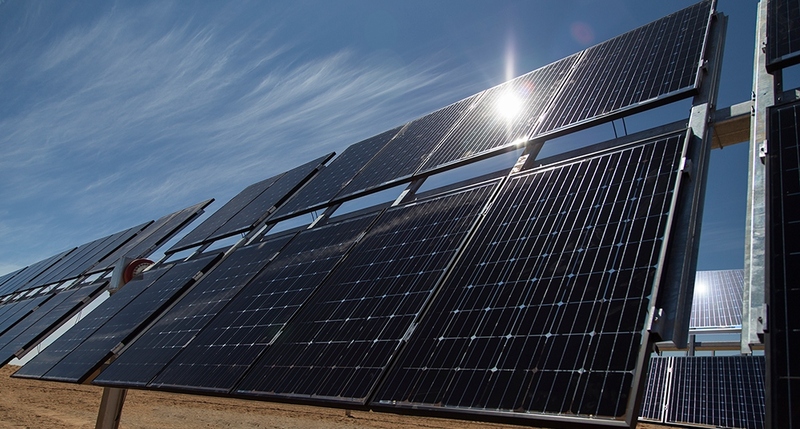 A new wave of bifacial module testing is complementing years of research in Europe and Japan. The primary goal of all the tests is to validate the predictive software performance model used to rate bifacial panels, so buyers can have confidence a given factory flash test value for albedo, or ground-reflected light, will correspond to performance in the field – depending on the variables under test at each site. For the next year fascinating datasets can be expected to emerge, comparing apples to oranges when competing tests are complete and overlaid, hopefully in a Venn diagram with some significance of commonality. “We’re primarily interested in validating our software models in System Advisor Model (SAM), which recently released a bifacial performance model,” said Chris Deline, an electrical engineering researcher at the U.S. National Renewable Energy Laboratory (NREL), one of the new test sponsors. “ We’re also interested in comparing with PVSyst, as the industry-recognized PV performance modeling tool.” Another test bed will also evaluate newer software that competes with PVSyst. The drawback to the tests is a lack of overall uniformity in exactly what is being tested under what conditions, although the first round of tests will likely point the way for a more comprehensive test of most bifacial panel manufacturers and several, if not the majority of tracker manufacturers. The cost of such an endeavor may require an industry sponsored project or an expensive multi-client study, as DNV GL has proposed. As the data from the tests flow in, initial rankings of bifacial panels by manufacturer will emerge. In most of the tests, performance data will be anonymous for the manufacturers, but those scoring highly may opt to have their brand data revealed. The reason the field tests are proliferating is to enable different sets of panels and trackers to be selected for solar projects with the rough equivalent of a matched bankability study. The albedo boost, currently hovering around 10% in many initial test cases, is broadly expected to rise to 20% or 30%, as key variables are metered and optimized for field design. While bifacial panels may increase energy yield by double digits, the cost of the panels thus far has held at single-digit premiums over monofacial alternatives. Ultimately, bifacial panels are likely to be sold at a price reflecting the expected power output, but that exact figure is still unclear. One of the first field tests to begin operation this year was the Soltec Bifacial Tracker Evaluation Center (BiTEC) in Livermore, California, for which data are being analyzed by independent engineer Black & Veatch. The facility is using Soltec’s SF7 single-axis trackers, with bifacial panels from Canadian Solar, Hanwha Q Cells, Jinko, Jolywood, Longi, and REC. Soltec is also collaborating with the NREL to assist primarily in the application of simulation models, and with the Renewable Energy Test Center (RETC), to use BiTEC data in their joint “Bifacial Characterization and Ranking Initiative, to assess the performance gains and validate the performance models on bifacial modules from global module manufacturers,” Soltec says. Among specific variables to be tested at the site – which is based on the Soltec SF7 tracker and six bifacial panel makers – are albedo, pitch, height and shading, among other potential areas of benchmarking. Thanks to private and federal funding, the NREL is mounting a sizable bifacial-tracker test bed. The invitation to participate is open, he said, adding: “We don’t have all of the equipment vendors completely locked down but we are considering or working with the following manufacturers: Trina, Canadian Solar, Sunpreme, Mission Solar, REC, Hanwha Q Cells, Longi, Jinko and others.” And the NREL is considering purchasing modules so it has no constraint on data release. It is also using two vanadium redox flow batteries with the NX Fusion Plus trackers, which will store some of the energy for dispatch after sunset. Sandia National Laboratories is also in the middle of a study of the performance of bifacial PV modules on single-axis trackers with several module suppliers, at Sandia in Albuquerque. The tests started in September and will continue through this year, with preliminary results possible in the summer. “We plan to test bifacial modules from Canadian Solar, Jolywood and JA Solar,” said Joshua Stein, a member of technical staff at Sandia. The list of variables being studied is long. “We have a total of four strings that are monitored for DC current and voltage as well as front and rear irradiance,” said Stein. “In this study, we are investigating the performance of different module technologies – including bifacial versus monofacial, full cell versus split cell, and PERC and n-type cells. We are also testing the effects of raising the different module types off the torque tubes. DNV GL is now installing what it calls the “largest bifacial solar panel test facility in the world,” at Davis, California, with the goal of benchmarking brand variations in the market to facilitate widespread U.S. adoption of bifacial plus tracking. The $250,000 project is being supported in part by a $200,000 grant from the U.S. Department of Energy. The DNV test site will house 1,500 V bifacial panel arrays from as many manufacturers as are willing to cooperate, said Tara Doyle, head of business development and project management at DNV GL. The tests are planned to include 50 kW products from four manufacturers – Trina, Hanwha Q Cells, Longi and Astronergy – mounted on Nextrackers. The participant pool may broaden, added Doyle. The company is also keen to convert the lab-to-field ratio into predictable numbers. “There is a wide range of manufacturer claims for the bifacial factor, so bankers … don’t know which data to believe,” said Tristan Erion-Lorico, head of PV module business and laboratory services at DNV GL. The goal is to put together a large set of bankable data that can be reported anonymously, to ultimately give project developers and others downstream peace of mind when they make purchasing decisions.